Beige Silk Wool Scarf. Warm Hand Painted Silk-Wool Scarf WINTER SANDS. Size 10.5x59. Birthday Gift, Bridesmaid Gift, Mother Gift. Gift-Wrapped. Pink Silk Wool Scarf. Warm Hand Painted Silk-Wool Scarf ICY SUNRISE. Size 10.5x59. Birthday Gift, Bridesmaid Gift, Mother Gift. Gift-Wrapped. This wonderful scarf is a unique blend of silk and wool (63% silk/37% wool). 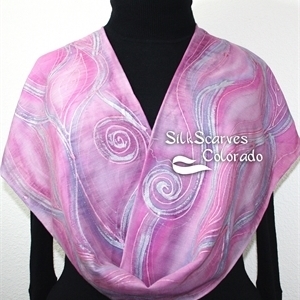 This one is a warm scarf in cool icy shades of light pink - it features swirly shapes in icy pink, light baby pink and rose pink All outlines are done in silver, with some silver spiral accents. 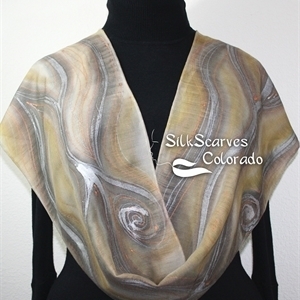 SIZE Medium Silk-Wool Scarf: It measures approximately 10.5" x 59" (27 cm x 150 cm). The original size 11x60 has some shrinkage of the wool ingredient due to the steam-setting process. This wonderful scarf is a unique blend of silk and wool (63% silk/37% wool). This one is a warm scarf in cool icy shades of light blue and grey - light sky blue, steel blue, silver grey, and some white. Decorated with very thin accents in silver. SIZE Medium Silk-Wool Scarf: It measures approximately 10.5" x 59" (27 cm x 150 cm). The original size 11x60 has some shrinkage of the wool ingredient due to the steam-setting process.